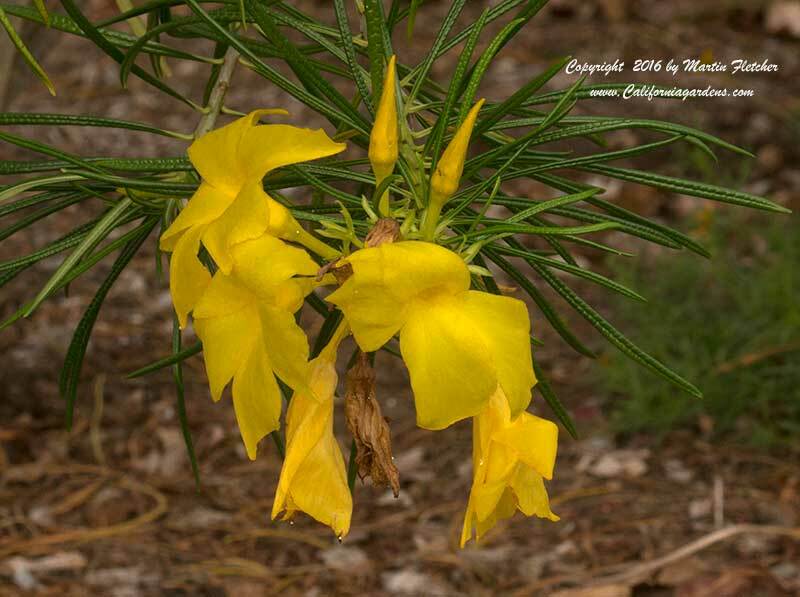 Cascabela thevetia, or Yellow Oleander is grown as a screening shrub or as a small tree. Like the Oleander all parts of the Cascabela thevetia plant are poisonous. Cascabela thevetia appreciates water and a moist garden, but tolerates far harsher conditions. Plants have survived near the California coast for years with little supplimental irrigation. Thus far I have not seen this plant escape into the wild as it has in Queensland Australia where it is called the Cook Tree. In that environment the trees clog the riparian zone. This plant was known in the trade for many years as Thevetia peruviana. It is native to South and Central America. Cascabela blooms Summer to Fall and may have sporadic blooms at almost any time of the year if it is not frosty. Plants will survive winter temperatures into the low 20°s F.
Flowers and foliage of Cascabela thevetia Yellow Oleander. High resolution photos are part of our garden image collection.